Three aerospace students from the University of Sheffield – including two members of SELA Cohort 2017 – have won a £5k prize after entering a UK Space Agency challenge with their proposal for an automated person detection system for use in humanitarian response to natural disasters. The SatelLife Challenge, now in its second year, was open to young people aged 11 to 22, looking for innovative proposals on how to use data collected from space to benefit our economy, health or the environment. 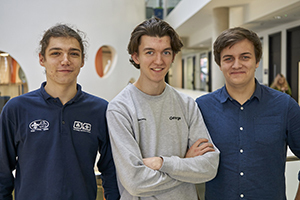 SELA Members Ben Schofield and George Nightingale, together with fellow aerospace student Tom Green, were judged to have one of the best submissions in the whole competition. Their proposal uses satellite data and machine learning to improve the efficiency of response to humanitarian crises, and is based on a research proposal that Ben and George will be carrying out with a research grant from SELA, in partnership with Sheffield Undergraduate Research Experience, this summer. Their system would use drones to survey a wide area, searching for people buried under rubble after an earthquake, for example. Drones enable a much larger area to be searched much more quickly than using traditional methods. The design uses machine learning, which enables computer systems to learn from and make predictions on data. The drone would produce an image using optical, thermal or sonar technology, and then send it to a remote ground station, where the image would be processed through a neural network (a complex algorithm loosely inspired by the networks which exist in animal brains) which has been programmed to detect humans. Ben Schofield, one of the project team members, said: “We learnt of this competition through SELA and thought that it was a great chance to work together on such an engaging project. The SatelLife challenge judging panel was made up of industry experts including representatives from the UK Space Agency, the European Space Agency, the Satellite Applications Catapult in Harwell and industry. In June, the University of Sheffield team will pitch their idea to a panel of ‘dragons’ from the space sector who will offer further prizes.